Sometimes the old ways are the best. 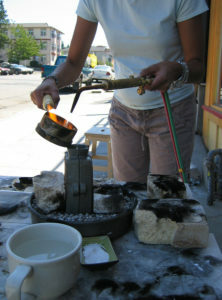 The first weekend in August silversmith and jeweler Juan Reyes will take students through several casting techniques that have been used for millennia in, Low-Tech Gravity Casting. Not only are they tried and true, these methods also use a minimal amount of equipment, and can be easily reproduced in a home studio, or even in your backyard. Juan will guide students through various mold making processes and approaches. 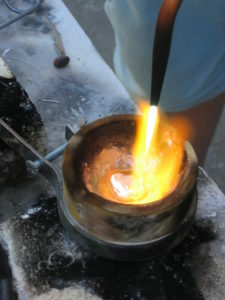 Whether it’s sand casting found objects, such as twigs or buttons, exploring the unique textures of cuttlebone, or carving your own molds in tufa stone that you can reproduce time after time, this two day casting class opens novice and experienced jewelers alike to this fun and rewarding sculpting method. It is also one of the best ways to use your scrap silver! With his expertise and enthusiasm Juan Reyes brings warmth and creativity to every class he teaches. He recently took the time to answer a few questions about his work. 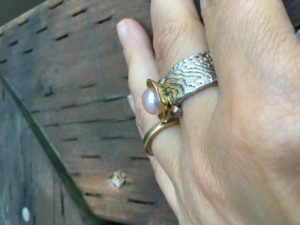 What got you started in metal smithing and jewelry making? My family has several jewelers in it. As a child, jewelry was something that I didn’t want to make when I was living with them. When I came to Seattle, I realized that I was missing that part of my family. 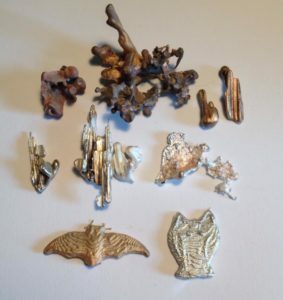 What do you like best about casting pieces? One of things I like about a casting a piece is that once you made the first piece, you can make a mold and make as many as you want. Do you have a favorite casting method? Sand casting is my favorite method. It’s easy for me, because you just have to have something to print into the sand, then you close the mold and pour the metal. However, at the end of my class everybody has their own favorite method. What are the biggest challenges new learners might have in this class? The big challenge that I notice in my class all the time for my students, is learning to be comfortable with a big torch and pouring the metal into a mold once the metal is melted. Do you have a favorite casting material? Silver is my favorite metal to work with. Silver is very forgiving, you can melt and reuse it many times, that’s why I like it.